Ruling the Indian Mobile Market for almost a decade, Nokia, is soon going to launch their much awaited Android-based Phone “NOKIA X” in Indian Market on this March 15th with a price of Rs.8,500/-. NOKIA X is already available for pre-booking on electronics retailer 'The Mobile Store' and lists the availability date as March 15. The phone is available in its Black, Green, Yellow, Cyan, Red and white color variants. 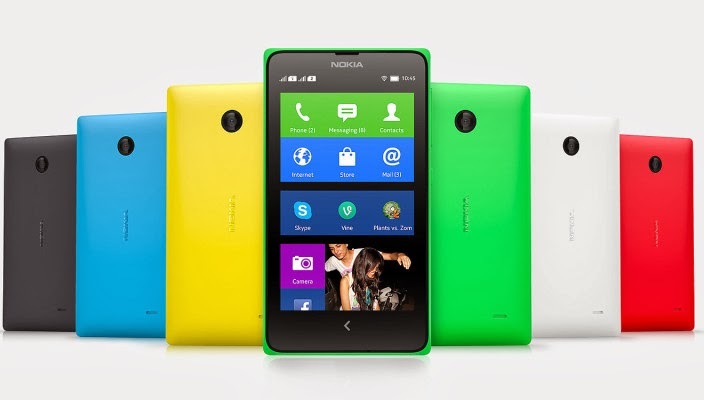 The design of the Nokia X is similar to Nokia Lumia. The phone's software platform is based on the Android Open Source Project (Modified Android Android Jelly Bean 4.1.2). It have combined Android apps with Nokia experiences (such as HERE Maps, Nokia Xpress and MixRadio) and Microsoft services (such as Skype and Outlook). The smartphone offers dual-SIM support with dual standby. The first Android phone from Nokia features a 4-inch IPS LCD display with 800×480 px IPS WVGA. The Nokia X is powered by 1GHz dual-core Qualcomm Snapdragon S4 processor, alongside 512MB of RAM. It sports a 3-megapixel rear fixed focus camera. The Nokia X handset comes with 4GB of inbuilt storage, and can be expanded up to 32GB via MicroSD card. The Nokia X supports Bluetooth, WI-Fi, GPS, AGPS, EDGE, GPRS and 3G connectivity options. It is backed by a 1500mAh battery, which can deliver up to 13 hours of talktime and up to 684 hours of standby time on 2G network.